Celebrate Canada’s sesquicentennial with this patriotic strip-pieced maple leaf flag quilt. Hang it on the wall or set the table for Canada Day – it will be a great memento of Canada’s 150th birthday! 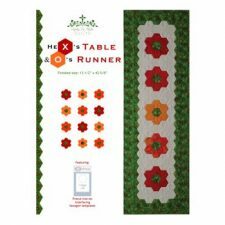 This charming table runner is made using precut iron-on interfacing hexagon templates and machine stitching. A quick and easy project that only looks complicated! What else is new in EQ8? New tools for importing fabric, hiding patch outlines and quilt layers, and so much more!